Synopsis: Staged for the Bolshoi by Bournonville expert Johan Kobborg, La Sylphide is the ultimate romantic masterpiece. 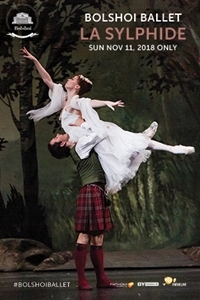 Captured live from the Bolshoi Ballet in Moscow, La Sylphide comes to cinemas across the U.S. on Sunday, Nov. 11 only. On his wedding day, the young Scotsman James is awakened with a kiss from an ethereal winged creature, a Sylph. Entranced by her beauty, James risks everything to pursue an unattainable love. La Sylphide is one of the world's oldest surviving ballets, and a treasure in Danish ballet master August Bournonville's style.